We have a fantastically dedicated team of skilled, trained volunteers and paid staff who offer a comprehensive and personal service. 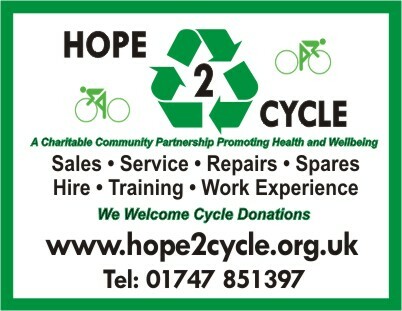 Our work is to service and repair unwanted bikes and put them back on the road. We also offer service, repairs to customers bikes in addition to new and recycled parts, cycle hire and maintenance training. We have extensive experience in supporting people who are socially excluded or recovering from health related problems in a work setting and are able to offer work experience and volunteering opportunties. Most of our work is undertaken at our workshop in Shaftesbury, we also visit other localities offering a mobile service to customers in their work settings, college, university or their own home. "Don't tip it, Recycle it"!